Coverbind has been around for more than 30 years, providing home offices, small business, government and schools high quality binding machines and supplies. Here we offer 10 different styles of binding covers and spines that will give that final professional touch to your next document while still offering a high level of durability. There are hard covers, linen covers, frosted plastic covers, ones with windows, any form of a cover, and Coverbind might just have it! Make sure you leave your clients impressed with this professional-looking binding style. Welcome to MyBinding video. 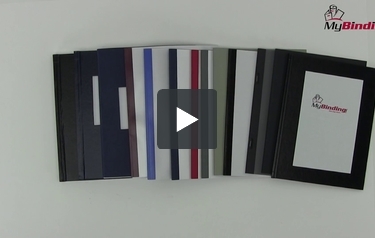 This video looks at the fantastic range of CoverBind Thermal Covers. Ranging in color, style, size and hard or soft, we have plenty of options with CoverBind. There’s even a staple option for tax or book reports. Spine sizes range from 1/16 of an inch to 2”, going from 15 pages all the way up to 500 sheets. From casual to formal and see-through and block front covers and you can even get dicut front windows on hard, soft and go green environmentally friendly folders. That is CoverBind thermal covers. For more demos, reviews and how to’s, check out MyBinding.com.